We send and track press releases we email to journalists on our live global database: at newspapers and magazines, television and radio stations, websites and wire systems. Your business releases will land on business desks and your consumer releases will reach consumer journalists, in all target areas, maximising your exposure and boosting coverage. Presswire also self-publishes releases across its own network of websites, as well as to major social media, so they are picked up by search engines, Google News, aggregators and RSS subscribers, bringing you high-value, long tail SEO benefits. Our industry-leading Press Release Distribution service works by sending your press releases directly to the journalists most likely to write about them. We do this by tailor-making bespoke lists for each individual release from our live Media Contacts Database of more than half a million editorial opportunities, across Regional and National Newspapers, Magazines (Trade and Consumer), TV, Radio and Online. 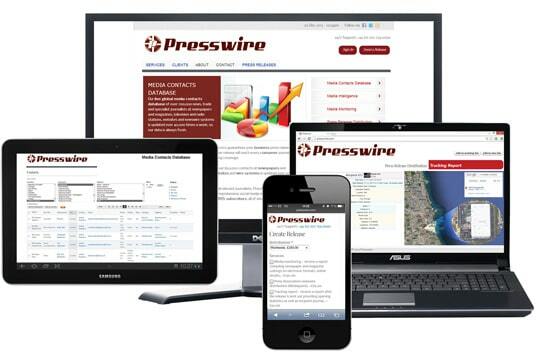 Press releases can be sent through our website by registered Presswire users, or directly if you email them to us. They can be sent as pure text or HTML, complete with images and embedded video at no extra cost. Prior to send-out, a human editor checks every press release for typos, spelling mistakes, broken links, corrupt formatting and missing images to ensure recipients and search engines always receive a faultless message. We then test send each release to ensure it always reaches the recipients’ Inbox folders, avoiding overzealous spam/junk filters. As press releases are distributed, our unique system tracks each recipient so we can report who opened them, whether they were forwarded, how many times they were read and how long they were read for. This provides you with immensely valuable data to compare pick-up metrics from one release to another, as well as providing you with a roadmap for following-up with your key targets. Where we identify that a recipient opened your release and looked at it for more than 4 seconds, we include their name, position, publication title and telephone number (where available), for following-up purposes. The average metrics provided at the top of the table show you how many opens, how many reads and how long an email was read for – this is invaluable when comparing one release against another, especially if you put multiple releases through Presswire in future, enabling you to tweak the language and presentation of future releases to boost pick-up and effectiveness. We syndicate all our customers’ press releases across our own network of websites as well as through social media like Twitter, Facebook, Feedburner, Digg and Delicious. We provide permanent links to our releases and push them onto Google News, promoting your keywords, content and links to major search engines for the long-term, providing quality back-links that will boost your search engine rankings and page rank for years to come. In terms of SEO-building, we provide an SEO [Search Engine Optimisation] Super Boost, for your press release’s main keywords. The Presswire Search Engine Optimisation Super Boost for Press Releases is the ultimate solution for customers who are serious about SEO. If you’re stuck in a Search Engine Ranking Position (SERP) below your competitors, then the Presswire SEO super boost can take your online visibility to the next level. Super Boosting the SEO of a Presswire Press Release comprises private blog posting, ethical whitehat link-building and the latest cutting-edge syndication methods to increase your website’s results position, even for the most competitive keywords. A standard Presswire Press Release SEO Super Boost promotes two keywords in any one release using high Google Page Rank (GPR) 1-5, niche-related, contextual backlinks from highauthority domains, with keyword analysis by our experts to ensure we’re promoting you to search engines in the best possible way. You will also receive a report one month afterwards, for every release you purchase an SEO boost for, so you don’t have to have to check keyword positions, yourself. 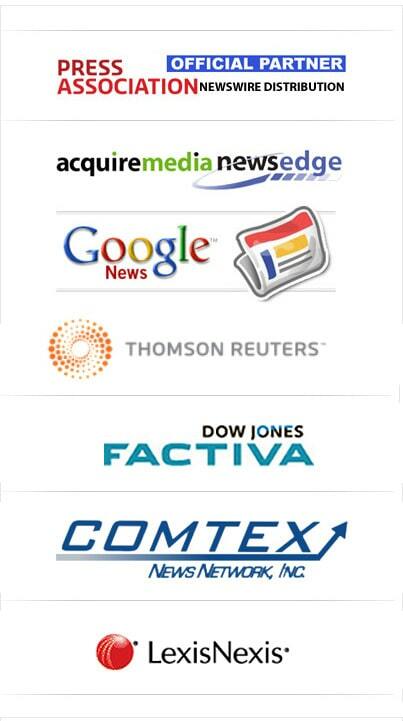 Reach national and regional newspapers, radio, TV, magazines and websites across consumer, trade and business media. To see more industries or sub-categories within industries or to view available lists of media outlets within selected industries, contact us. Distribution to over 40 European countries in English, German, French, and Spanish, reaching over 2,700 media points in Eastern, Western and Central Europe. Includes government press offices, centralised news agency networks and newspaper desks. To see more industries or sub-categories within industries or to view available lists of media outlets within selected industries, contact us. Includes broad national coverage, major regions and targeted local areas with distribution to websites, database and trade publications at no extra cost. To see more industries or sub-categories within industries or to view available lists of media outlets within selected industries, contact us. Our World option takes your message global. This includes full national distribution, which ensures your release is sent to wire services and financial terminal systems, top web sites, trade and consumer publications in a vertical industry of your choice as well as top newspapers and broadcast outlets across the US and Canada, Latin America, Europe and Asia. Translation into most other major languages is available. To see more industries or sub-categories within industries or to view available lists of media outlets within selected industries, contact us. Includes the service you specify above, plus distribution directly onto the international news wire systems all global newsrooms rely upon to plan and execute news running orders and production. To request a list of our news wire services, contact us.